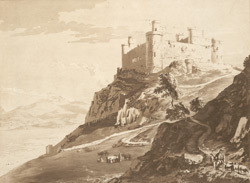 View of Harlech Castle in North Wales. The castle was begun in May 1283 at the instigation of Sir Otto de Grandison, it was designed by James of St George the master of the Kings Works in Wales. The castle stands on the Rock of Harlech and is built to a concentric design; it is surrounded by a low perimeter wall as well as an impressive inner curtain wall with huge round towers built on each corner. The seaward sides of the castle were defended by sheer cliffs and the more vulnerable east side of the castle was strengthened by a very large gatehouse that even contained comfortable residential quarters.